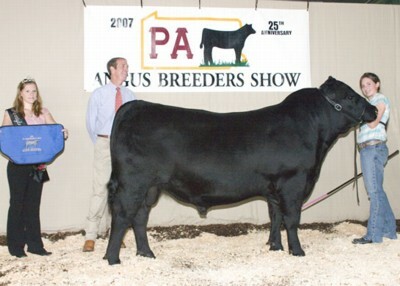 B C A Ross S61 won grand champion steer at the 2007 Pennsylvania Angus Breeders Junior Show, July 13 in Huntingdon, Pa. Andrea Foore, Seven Valleys, Pa., owns the April 2006 son of B C A Limited Explorer D21. Howard Hoffman, Far Hills, N.J., evaluated the 106 entries. Photo by American Angus Association. 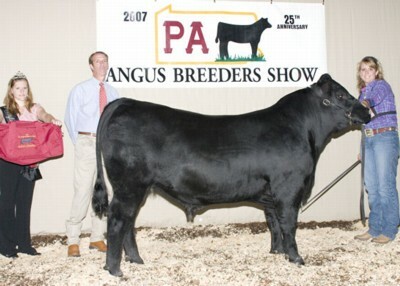 Lisnageers Joe Pa 601 won grand champion bred-and-owned steer and reserve grand champion steer at the 2007 Pennsylvania Angus Breeders Junior Show, July 13 in Huntingdon, Pa. Ryan Fairbairn, Coatesville, Pa., owns the January 2006 son of N Bar Emulation 5522 4245A. Howard Hoffman, Far Hills, N.J., evaluated the 106 entries. Photo by American Angus Association. 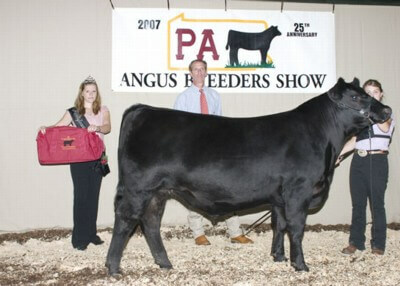 Cedar Hill Joey WWJD won reserve grand champion bred-and-owned steer at the 2007 Pennsylvania Angus Breeders Junior Show, July 13 in Huntingdon, Pa. Amanda Thompson, Wellsville, Pa., owns the June 2006 son of Cedar Hill Imp W W J D. Howard Hoffman, Far Hills, N.J., evaluated the 106 entries. Photo by American Angus Association. 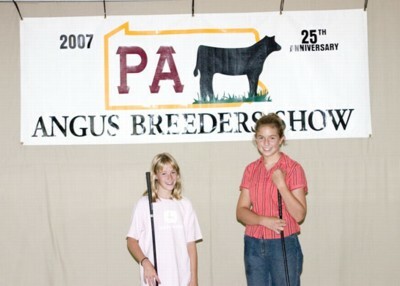 These juniors won overall and senior showmanship honors at the 2007 Pennsylvania Angus Breeders Junior Show, July 13 in Huntingdon, Pa. Pictured from left includes Caitlyn Domitrovich, Aliquippa, Pa., champion; and Gwen Powers, Bethel, Pa., reserve champion. Photo by American Angus Association. 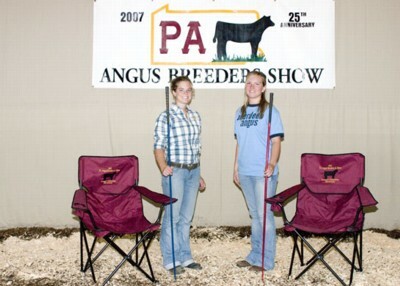 These juniors won novice showmanship honors at the 2007 Pennsylvania Angus Breeders Junior Show, July 13 in Huntingdon, Pa. Pictured from left includes Alana Eisenhour, Wellsville, Pa., champion; and Alexis Cash, York, Pa., reserve champion. Photo by American Angus Association. 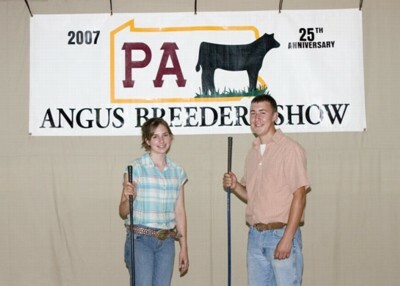 These individuals won top junior showmanship honors at the 2007 Pennsylvania Angus Breeders Junior Show, July 13 in Huntingdon, Pa. Pictured from left includes Kate Livingston, Dover, Pa., champion; and Marshall McKean, Mercer, Pa., reserve champion. Photo by American Angus Association. 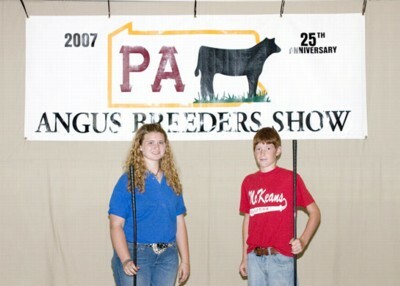 These juniors won top intermediate showmanship honors at the 2007 Pennsylvania Angus Breeders Junior Show, July 13 in Huntingdon, Pa. Pictured from left includes Katrina Frey, Quarryville, Pa., reserve champion; and Richard Hannum, Oxford, Pa., champion. Photo by American Angus Association. 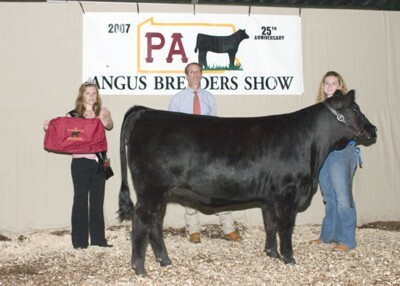 J D H WD VRD Sandy 0776 won champion spotlight heifer at the 2007 Pennsylvania Angus Breeders Junior Show, July 13 in Huntingdon, Pa. Alana Eisenhour, Wellsville, Pa., owns the February 2006 daughter of Vermilion Dateline 7078. Photo by American Angus Association. 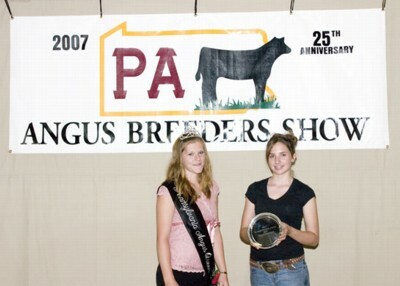 Katrina Frey, Quarryville, Pa., won premier junior breeder at the 2007 Pennsylvania Angus Breeders Junior Show, July 13 in Huntingdon, Pa. Photo by American Angus Association. 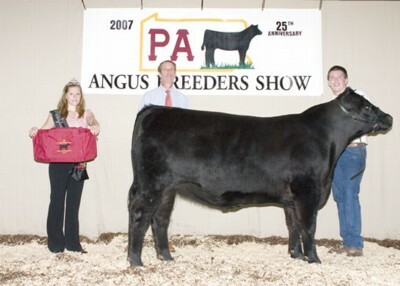 Freys KJF Hustler M35 R61 won grand champion bred-and-owned bull at the 2007 Pennsylvania Angus Breeders Junior Show, July 13 in Huntingdon, Pa. Katrina Frey, Quarryville, Pa., owns the March 2006 son of B C Marathon 7022. Howard Hoffman, Far Hills, N.J., evaluated the 106 entries. Photo by American Angus Association. 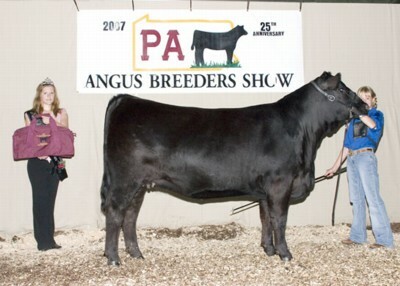 H J M Titan 609 won reserve grand champion bred-and-owned bull at the 2007 Pennsylvania Angus Breeders Junior Show, July 13 in Huntingdon, Pa. Megan Fuls, Richland, Pa., owns the May 2006 son of G 13 Structure. Howard Hoffman, Far Hills, N.J., evaluated the 106 entries. Photo by American Angus Association. 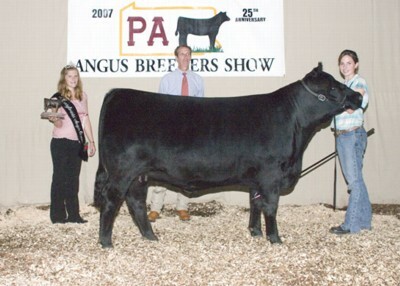 B C A Black N Fancy K612 won grand champion owned female at the 2007 Pennsylvania Angus Breeders Junior Show, July 13 in Huntingdon, Pa. Hannah Grim, East Berlin, Pa., owns the May 2006 daughter of TC Freedom 104. She first won intermediate champion. Howard Hoffman, Far Hills, N.J., evaluated the 106 entries. Photo by American Angus Association. 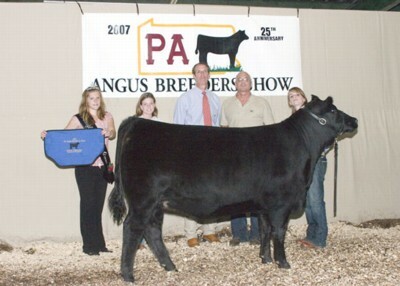 KF Wetonka Queen S604 414 won reserve grand champion owned female at the 2007 Pennsylvania Angus Breeders Junior Show, July 13 in Huntingdon, Pa. Alexis Cash, York, Pa., owns the January 2006 daughter of Mytty In Focus. She first won junior champion. Howard Hoffman, Far Hills, N.J., evaluated the 106 entries. Photo by American Angus Association. 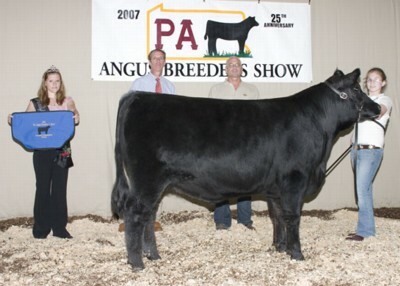 Freys KJF Ark Pride K32-R36 won grand champion bred-and-owned female at the 2007 Pennsylvania Angus Breeders Junior Show, July 13 in Huntingdon, Pa. Katrina Frey, Quarryville, Pa., owns the February 2006 daughter of W C C Special Design L309. She first won junior champion. Howard Hoffman, Far Hills, N.J., evaluated the 106 entries. Photo by American Angus Association. 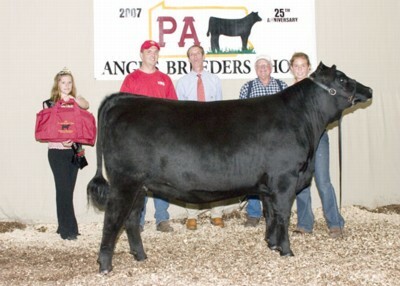 KML 476M Sky 616 won reserve grand champion bred-and-owned female at the 2007 Pennsylvania Angus Breeders Junior Show, July 13 in Huntingdon, Pa. Kate Livingston, Dover, Pa., owns the June 2006 daughter of B C A Limited Explorer D21. She first won intermediate champion. Howard Hoffman, Far Hills, N.J., evaluated the 106 entries. Photo by American Angus Association. 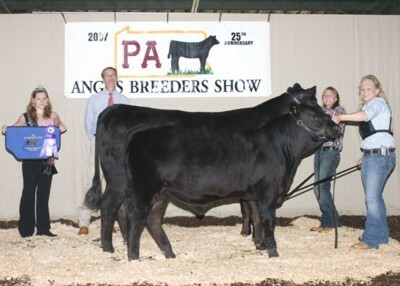 Rains Dream On 07RLE722 won grand champion cow-calf pair at the 2007 Pennsylvania Angus Breeders Junior Show, July 13 in Huntingdon, Pa. Lindsay Upperman, Chambersburg, Pa., owns the January 2005 daughter of Bon View New Design 1407. Her calf is a December 2006 bull sired by U H A Saugahatchee 348 025. Howard Hoffman, Far Hills, N.J., evaluated the 106 entries. Photo by American Angus Association. 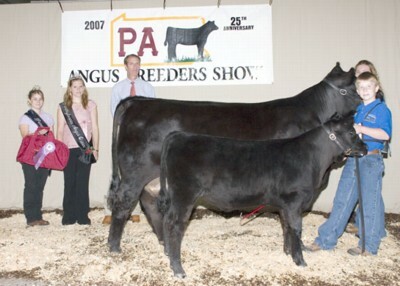 T N L 9826 Erica 413 won reserve grand champion cow-calf pair at the 2007 Pennsylvania Angus Breeders Junior Show, July 13 in Huntingdon, Pa. Kyle Livingston, Dover, Pa., owns the April 2004 daughter of B C A Limited Explorer D21. Her calf is an April 2007 heifer sired by TC Freedom 104. Howard Hoffman, Far Hills, N.J., evaluated the 106 entries. Photo by American Angus Association.